My folks met Ishmael Beah at Hay a couple of weeks ago. 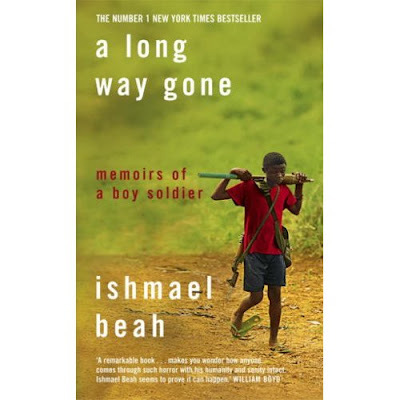 On their recommendation, I bought A Long Way Gone - Beah's own story of the descent into hell in Sierra Leone and his time as a child soldier, fed a diet of cocaine mixed with gunpowder. A couple of pages in, and you will be utterly hooked. This is one of the most harrowing and compulsive books you will ever read. I read this book over Spring break. A great page turner in a light literary kind of way. I couldn't believe 1/4 of the thing those kids went through. And to think some of them got kidnapped at 5. Makes you wonder about humans; the thing we do to get other. Is there any hope in a world were children are turned into the killers of their own blood-brethren? Are you kidding? This guy is no hero. He's a total literary fraud. He's found a good thing (if you can call killing as a child soldier a good thing)...and he's used it to advance bis career. The book is a literary fraud, and that is beyond doubt.